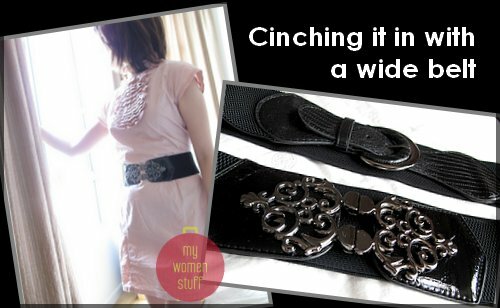 It’s been a bit of a hassle for me to find wide waist cincher belts here. I’m not about to pay a truckload of money at places like Topshop for something I could just as easily pick up at a little boutique. Yet, I don’t haunt little boutiques so you see my pickle. What is nice about such belts is that they create a waist where none is found. They do work best with dresses I find. This is especially so if you have a loosely fitted dress that might be a little big at the waist or have no waist. A belt helps take care of that problem. It also works with fitted shift dresses for a change in how it looks. In fact, what I find these belts do is pull in the eye so you look like you have an hourglass figure even if you do not, in reality. Best if you wear a lovely flowy dress with a full skirt too. I love the belt too! I practically use it with everything. Current favourite is beige coloured elastic, cream coloured butterfly clasp one. i like to wear belts too but somehow i find that some type of belts does not compliment my figure since im thin but i do not have waist too ='( can u make a post which type of belt fits different types of figure i.e. wide belt, thin belt, clinchers etc.? Wow thanks for the confidence but unfortunately I’m not very good at fashion tips LOL… I will try to find some information on this but I can’t promise yeah? I don’t usually wear belts most of the time except when I wear dresses and only when I bought these belts recently! Hmmm, I’d like to think that thinner belts suit thinner people? Like how petite girls go with a Chanel 2.55 kind of bag, while taller and bigger size people go with a large tote. I personally am medium size in weight and height, and I find that ultra thick belts (~10cm wide) cuts my body up so small. Makes me look really short and suddenly small sized. I’d like to look taller, so I’d rather go for the standard ~5-7cm wide kind (like Paris’s in the picture). Puffy/big tops worn with belt, will give the impression of a figure for thinner people, instead of tight and really fitting ones. Since you’re thin, you may wear prints really well! Prints do make people look fatter, and I myself can’t carry it off as nicely as runway models (I am too fat). Try vintage floral prints dresses with flat coloured belts with metal clasps. Match the belt colour to the base colour of the dress. =) You really have just got to try on every belt you intend to buy… … I face the same problem with sunglasses, 99.99% of sunglass shapes don’t suit. Hope it helps, my 2-cents worth. ah thanks for the idea jyoan! definitely will try to wear as you suggested! You gotta wear it on your waist..It’ll look way better! =) I like clinchers..but not if they’re too wide. I always choose black or dark brown though..I think it matches my clothes more. LOL You do not have “flabby bits”!